It’s been a long time since my first quiz for non-natives, which readers told me they found useful. I’ve also had various requests to give a bit more attention to American English. 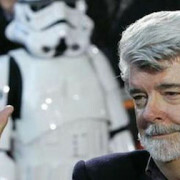 So I thought I’d celebrate the momentous continuation of the Star Wars saga by looking at a speech from its creator, George Lucas. 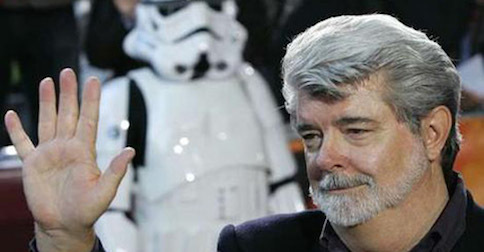 In it, Lucas briefly sketches his career and offers some advice for the young. The whole speech can be viewed on YouTube here. It caught my attention because the video has been automatically captioned by YouTube’s software; and, as in the material for my previous quiz, the subtitles contain plenty of divergences from the speaker’s actual words as I hear them. Twenty-two examples are reproduced below with the corresponding audio clips. I invite you to submit your own interpretations of the audio clips, as it’s very useful for me to see how native speech is heard by speakers of different languages. You can submit anonymously; I only ask you to specify your first language. You can answer as many or as few of the questions as you like, and add any comments you may have. Unfortunately I can’t respond to individual submissions. Two points should be made. First, Lucas is not an exceptionally unclear speaker (though his voice quality is a little rough). His accent is General American, his style is conversational, and most of his deviations from the dictionary or ‘citation’ forms of words are quite typical of native speech. His vocabulary is not obscure; only a few of the clips require some knowledge of film. Secondly, although there’s been high-profile criticism of YouTube’s automatic captioning, this post should not be taken as dismissing it out of hand. Having worked myself in the challenging field of speech technology, I consider it impressive that the captioner works as well as it does. The deviations from the correct words usually have some motivation, which I’ll discuss in more detail when I present the answers to the quiz in a week or so’s time. Have fun, and may the Force be with you!